I recently encountered an issue with my XC12 casette tape drive modified to support Turbo. It was reliably denying other devices on the peripheral bus to work properly. I did a quick analysis and found, that the DATA_OUT pin is overloaded by the following RC component. 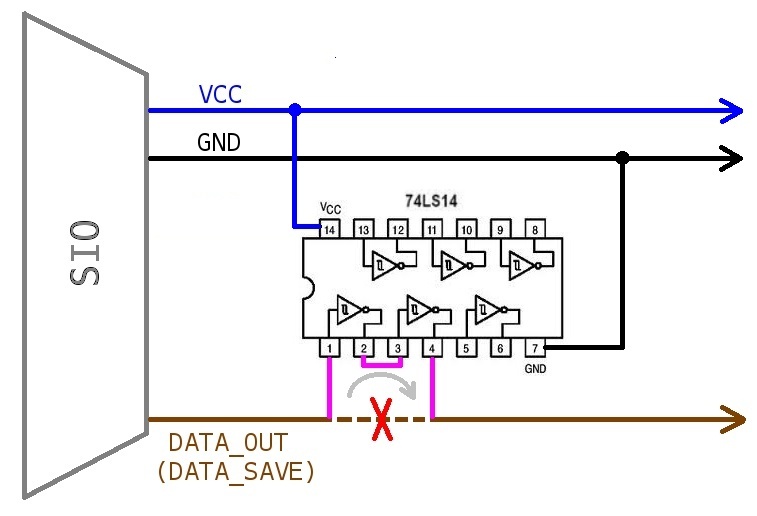 The RC component output is grounded instead of being disconnected when the recording button is NOT pressed. Jiří Richter (author of the czech Turbo) confirmed, that the R6 resistor really needs to stay at 3k9 (the latest recommended value is 4k3) and proposed the following modification instead of putting the original 10k resistor back. I tried that and it works! The 74LS14 circuit (SMD version recommended) fits directly in the cover of the DSUB15-F connector (SIO connector replacement).